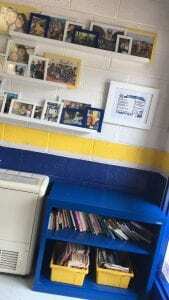 When we painted the school office, the document holder was no longer needed. In lieu of getting rid of it, it turned into a book display that we hung at a Kindergartener’s height in between the bathrooms. 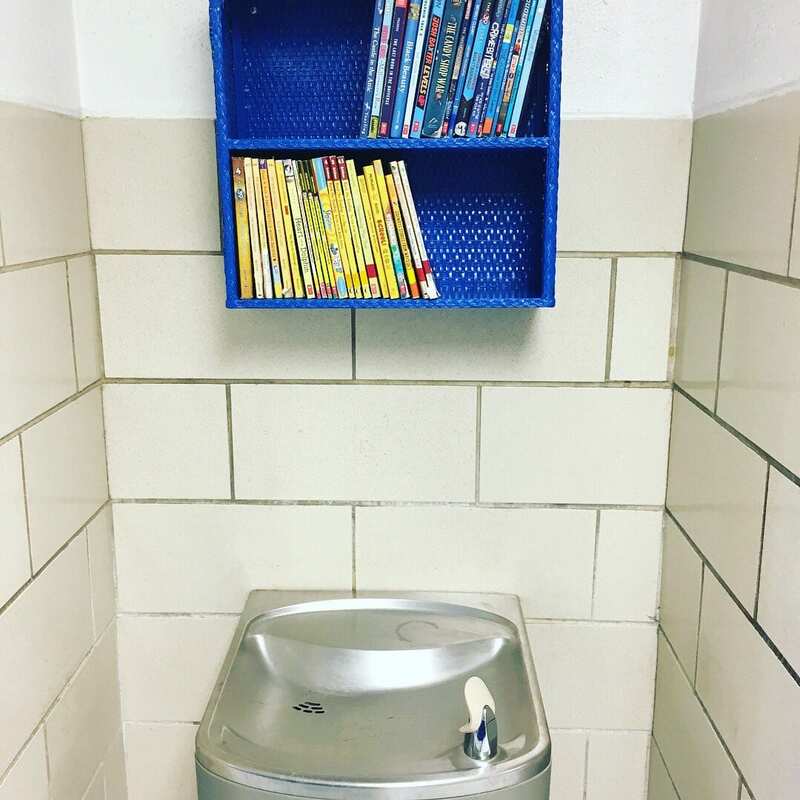 The teachers now can access these books and use restroom break time as an opportunity to do a read aloud. We ensure that quick and easy books are accessible and refresh them with seasonal or high interest books. You can purchase similar holders for about $20.00. You can get a 10 foot section of gutter for about $4.00. That makes the display below economical and fun! The best part of this display as that you can put books forward facing for students to see the covers. We put these in between the two doorways that lead to our gymnasium. Students use them during the day, but we also love when students and siblings access them in the evenings during basketball or other sporting events. It may seem like common sense, but it’s not always how you display your books, but WHERE you display them that can make an impact. 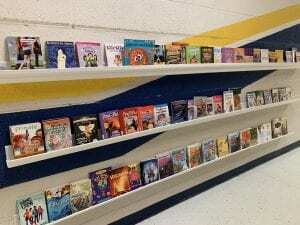 We placed two bookshelves in our foyer where students enter in the morning and wait for rides at dismissal time. It is also the area where students that are leaving early may wait for their parents. This provides access to them to seize those important minutes during the day. 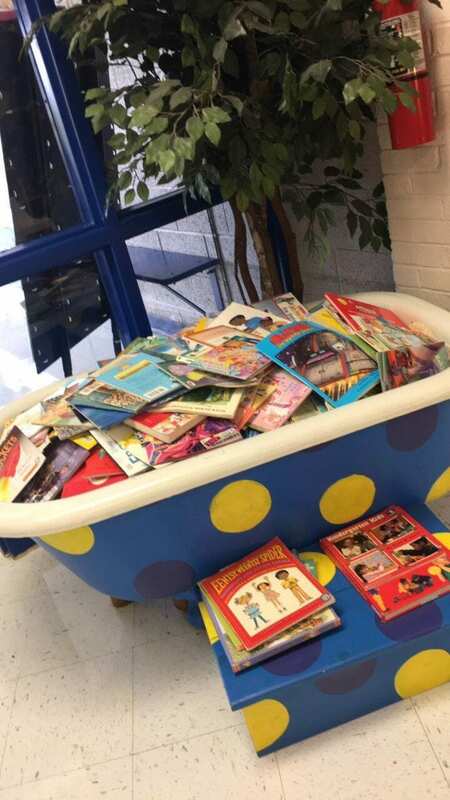 A staff member approached me one day and shared she had a bathtub in her garage that she was eager to get rid of and she knew our school would find something to do with it. We placed it in our foyer and it wasn’t long before we started filling it with books. Students rifle through it searching for their favorite stories and it is one of my favorite areas for books in our whole building. Consider what other vessels can hold books and create excitement for books. An old boat? A telephone booth? A swimming pool? An old interesting cabinet? A lemonade stand? I was walking through a local thrift store when a white wicker shelf caught my eye. It was $2.50 and it screamed BOOK display to me. We spray painted it blue and hung it above a water fountain. 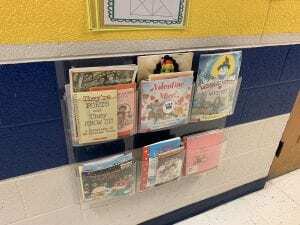 There are lots of different and CHEAP opportunities to place books in non-traditional areas. Promoting a culture of readers means remembering the professionals too! 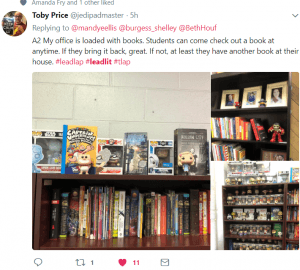 Adults are readers and the principal’s office can serve as a strong model for that. 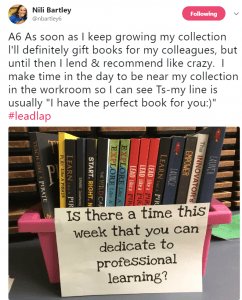 Building a strong professional library that is accessible to staff is necessary. 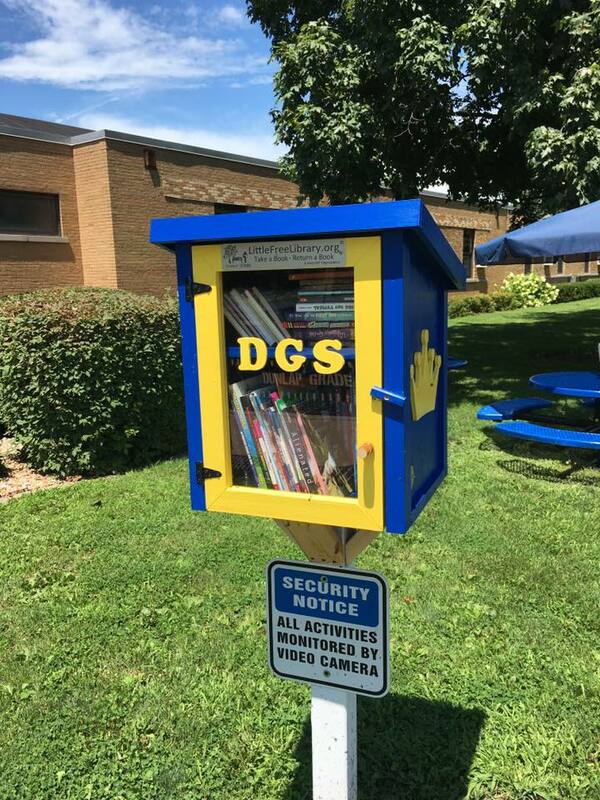 Outdoor spaces are a prime location to promote a culture of readers during and after school hours. 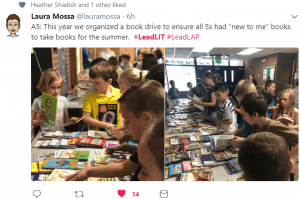 Maintaining a quality supply of books that students and the community can access at all times promotes a love of literacy. We display one in the front of our building and also on our playground. Let’s be real. When we are in the restroom, a little reading material never hurts. We maintain some magazines and books in our staff restroom. We are using magnetic document frames to display poetry, short stories and math word problems in the student bathroom stalls! Look at your space and school. 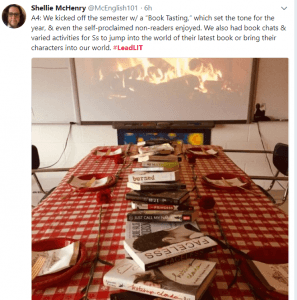 What does it communicate about reading? What can you do to enhance it? 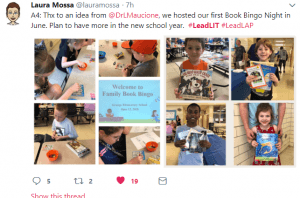 Share your ideas and keep building a culture of readers! It has been almost two weeks since our students eagerly raced out of the doors of school and into the wonder and rest that the winter break brings. Whereas staff and students alike were excited for a little time off, I am just as excited to welcome our students back on Monday. 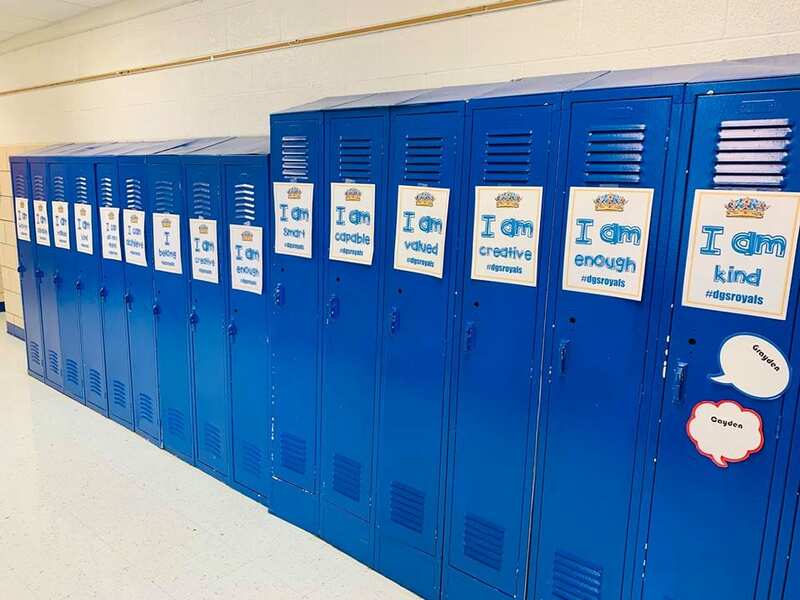 I spent a little time creating some positive affirmation signs and hanging them on the lockers and cubbies of our students. 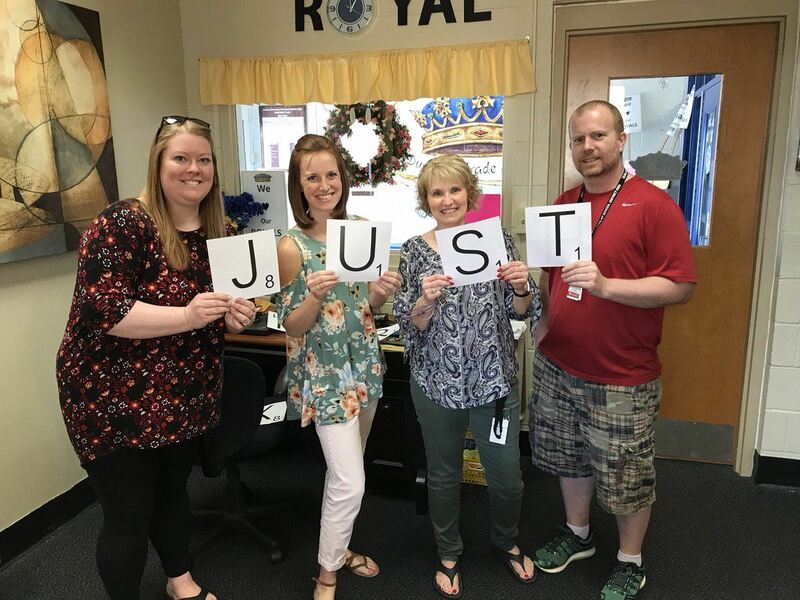 The messages vary, but all are intended to let our students know that we missed them, we care about them, and we are excited for the remainder of the school year. 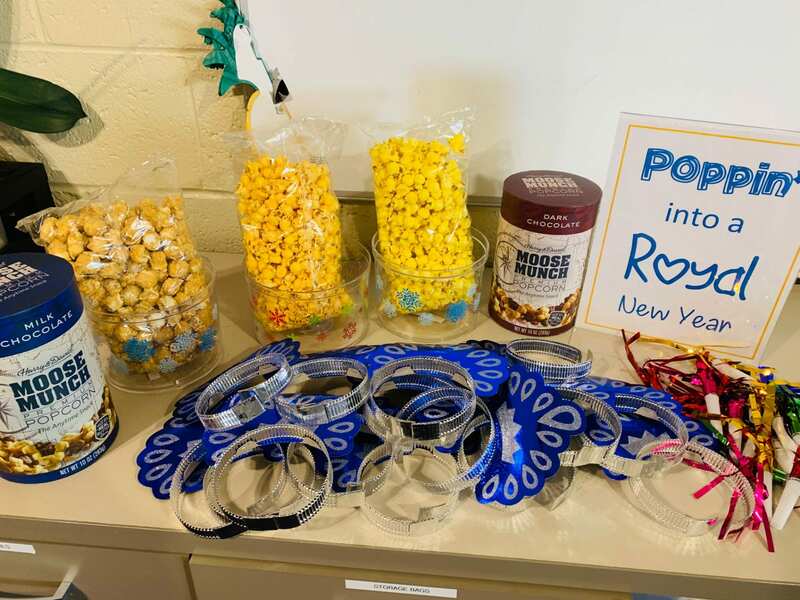 To get the students excited for returning to school at arrival time, teachers are encouraged to greet them in the hallways and at the door with New Year’s Eve headbands and noisemakers. These were purchased inexpensively at Dollar Tree and after season sales make them affordable at other stores. As simple popcorn bar is being put in the lounge to welcome the teachers back as well. Afterall, I missed seeing them each day too! You can view the PDF or editable word file of the posters below. Each year I choose a word to provide focus and clarity to my year. I refer to the word often and allow it to guide my work as a mom, wife, and educator. Many years, it requires ongoing thought and brainstorming. There have been years where it has taken me days or weeks to find the right word to sum up my goals and aspirations for the year. This year was different. 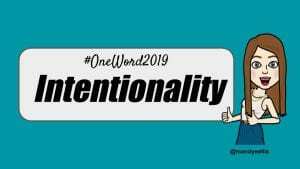 For a variety of reasons, the word, “intentionality” screamed at me this year loud and clear and the moment I started brainstorming my word, this was and continues to be the only word that resonates with where my head and heart are at currently. As a mom, wife, educator and leader, I find myself regularly trying to find balance in my life. I am constantly trying to find opportunities to be more effective and efficient. 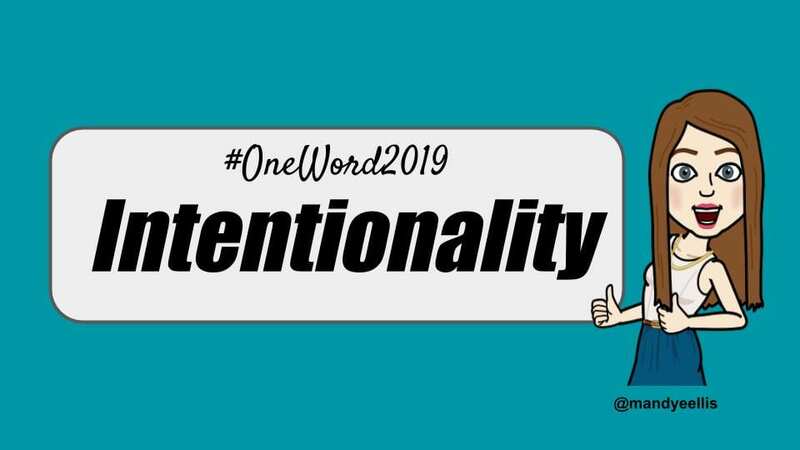 I schedule each part of my day and week with the best interests of my students, staff and family in mind, but I internally find myself reflecting on the purpose or intent of the actions. the fact of being deliberate or purposive. the quality of mental states (e.g., thoughts, beliefs, desires, hopes) that consists in their being directed toward some object or state of affairs. Intentionality will allow me to focus on priorities in my home, school, and with my relationships. Intentionality will allow me to ensure I am being focused and purposeful. Here’s to 2019 and intentionality. 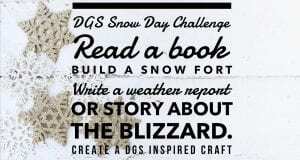 Looking for a way to engage your kindergarten students before school or to reach out to students on a snow day? 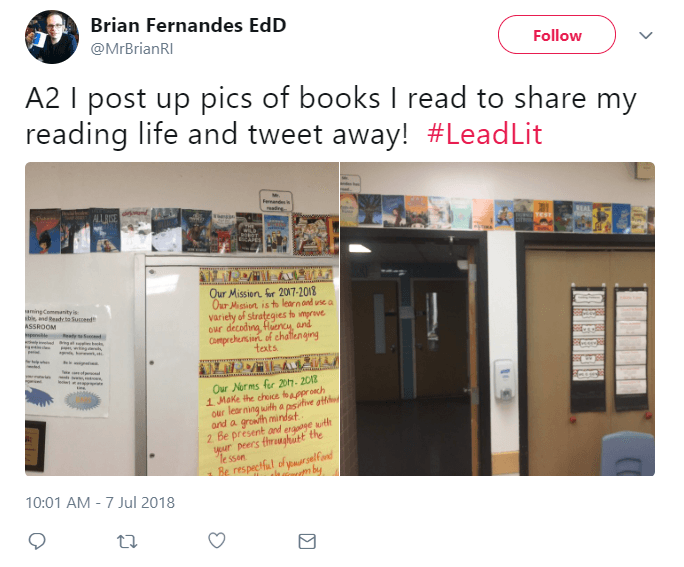 Social media read alouds can be the perfect avenue. 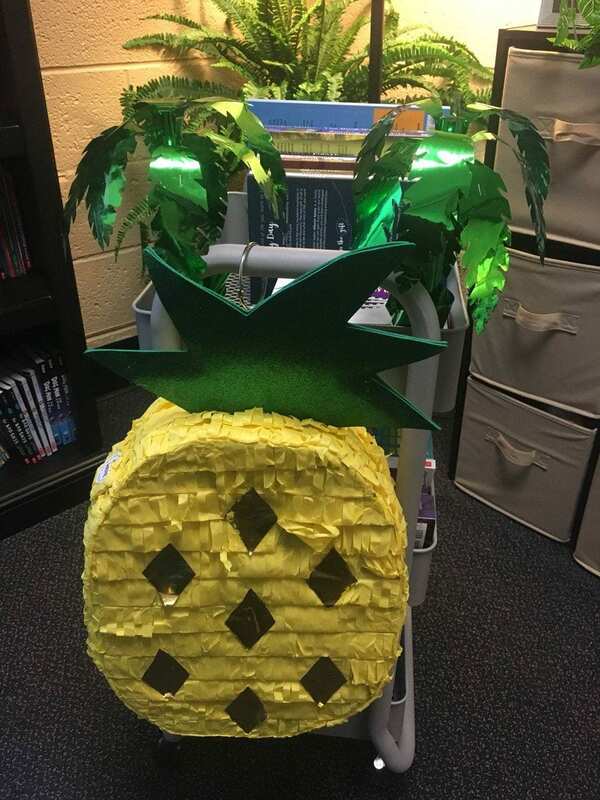 When students aren’t in our buildings, we have to find creative ways to connect with them and continue to build a culture of readers. Social media can be an engaging and accessible avenue to share stories. 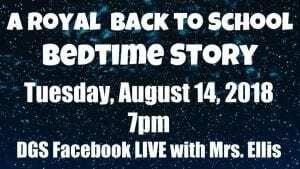 Consider doing a Facebook LIVE video of a read aloud. 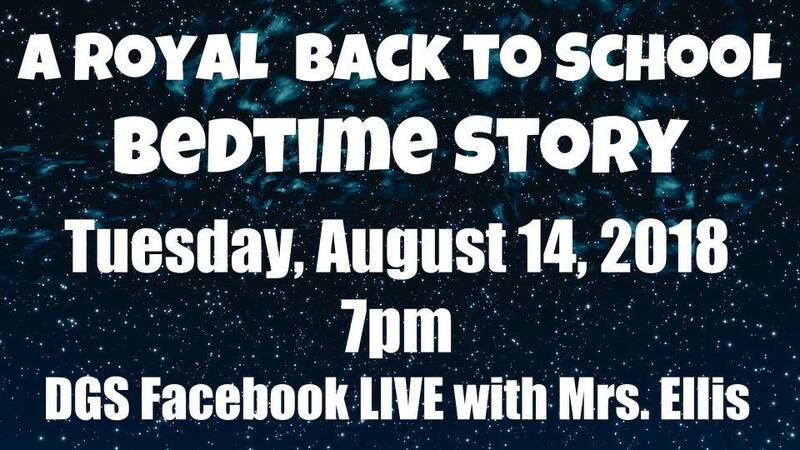 Promote the event ahead of time by setting a designated time for parents and students to tune in. You can do this from your living room, office, or other location or even while on vacation. The simplicity of a read aloud makes it easy to implement, and social media stories can be done for any topic, theme, or special event. 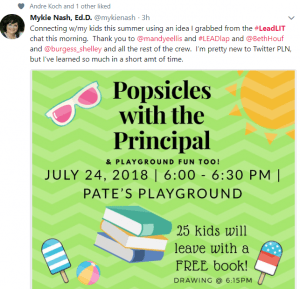 Challenge them and Create a Community of Learners: This past week, we had a snow day, while scrolling through facebook, I realized that this was the perfect opportunity to engage with my students and encourage learning on their bonus day off. I quickly used Canva to put together a graphic to post to our social media page. 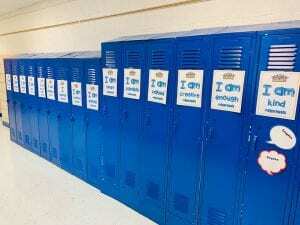 Students and their parents were encouraged to send in photos of their students completing any or all of the four proposed challenges. Those that participated were offered a small prize upon returning to school. 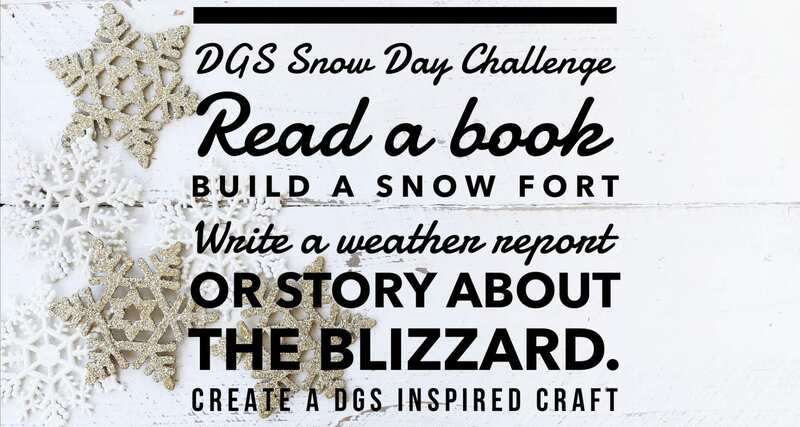 On our first attempt of the snow day challenge, nearly 40% of students participated! We look forward to seeing this increase in the future with further promotion and strategic communication. 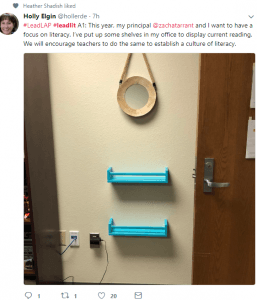 Flip it with Flip Grid: FlipGrid provides a unique and engaging platform to promote learning in many ways. FlipGrid allows users to record short videos and populates them on a collaborative form to view and share. 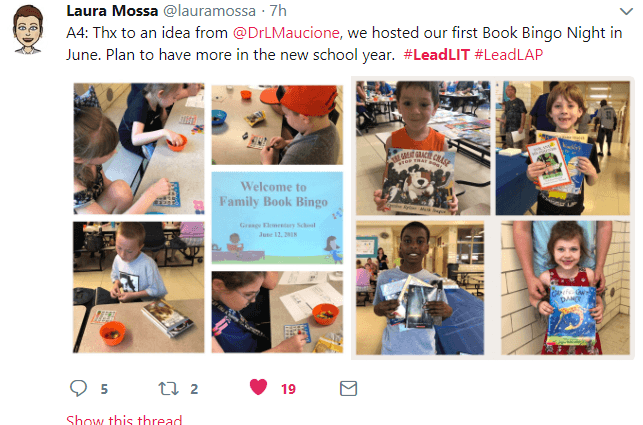 To promote reading, set up a grid for staff to record their favorite read alouds and share them on social media throughout the summer or over breaks. Enhance this by engaging students in the process and allowing them to record themselves reading their favorite books and share them as well. You can spotlight district office staff or seek submissions from parents or community members. 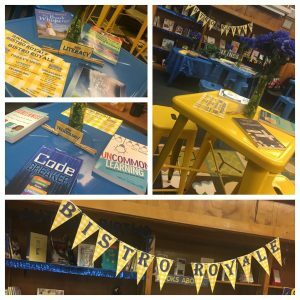 Have students join a grid to share their favorite book titles through short book talks. 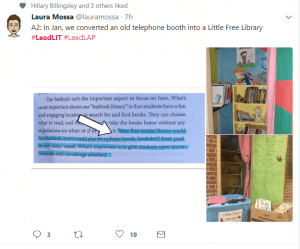 Provide students the option of using FlipGrid to share their personal writing pieces. Have staff share tidbits about how they engage their students in reading by recording a FlipGrid. Reach out to other schools or classrooms and have students share their reflections about a common title with others as reading buddies. 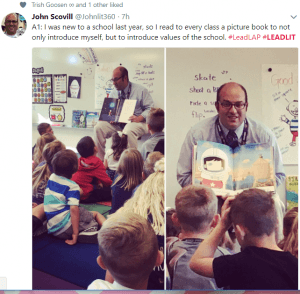 Ask older students to record picture books for younger students. 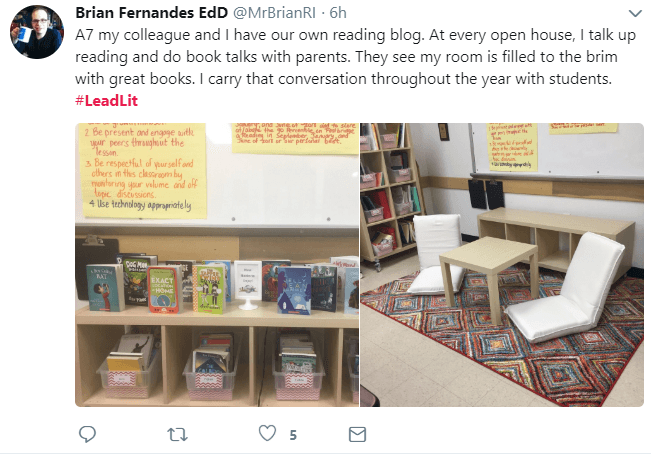 There were so many wonderful ideas and tweets shared today about creating a culture of readers. I curated 15 of them to share with you. These easy to implement ideas can be done at any level, in any setting, and in any position. 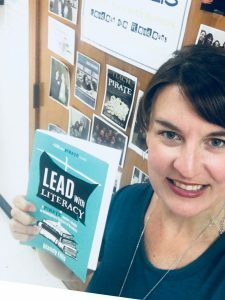 You can learn more about some of these strategies and more in the book, Lead with Literacy. 1. 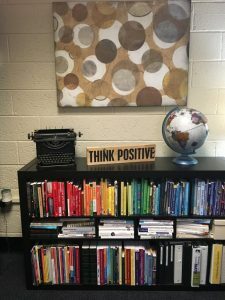 Display what you are reading, have read, or what is next on your reading list outside your classroom or office space. 2. Be intentional about reading to students. It’s a great way to break the ice, but also build relationships and rapport. 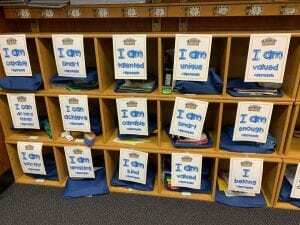 Books can unify classrooms and the school with a common message and set of values. They teach vital skills and lessons. 3. 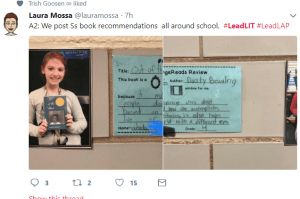 Allow students to make and share book recommendations with each other. Have them post them around the school, share them virtually, or do book talks! 4. Be creative in how you display books. It could be a bathtub, lemonade stand or even a photo booth like this one! 5. Give the literal gift of reading by gifting books whenever possible! Become “the book guy” in your school system where parents and community members know they can drop off books to be donated. 6. Post copies of the books you are reading or have read in your classroom or school space. 8. 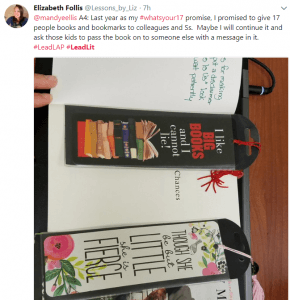 Resolve to give books to colleagues! 10. Host a book swap where students and or staff exchange their books for new/used ones! 11. 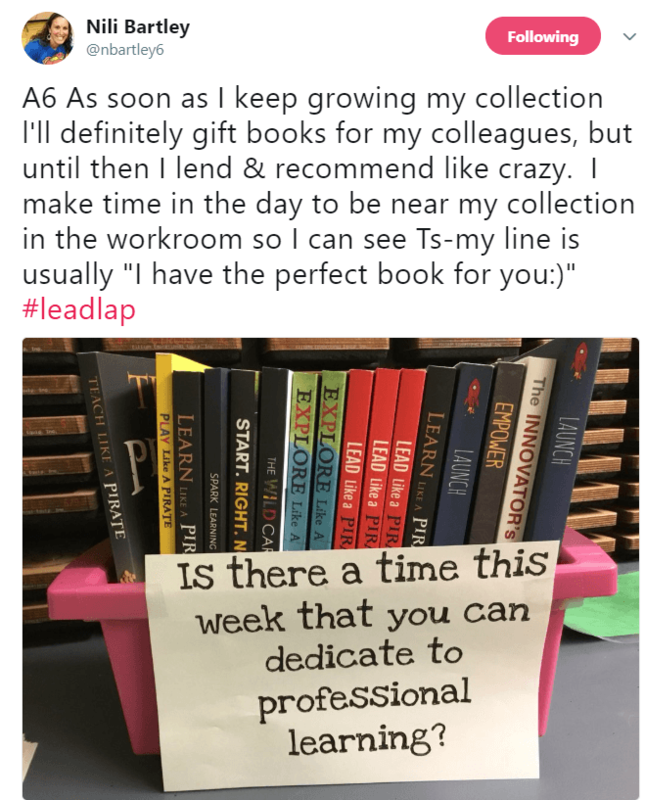 Encourage professional reading by sharing your professional library collection with others. 12. 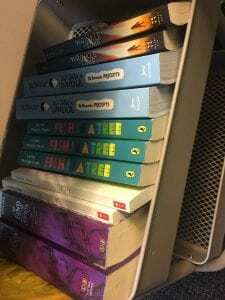 Flood your work space with books! 13. 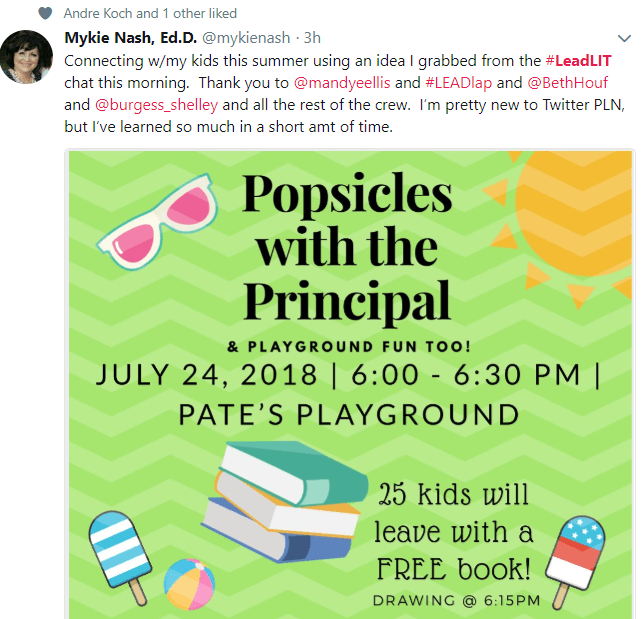 Host events in the summer months to connect with kids and build the love of reading. 14. Eat with kids over lunch and talk about books. 15. Create comfortable reading spaces and always talk about books with kids, colleagues and parents every chance you get! 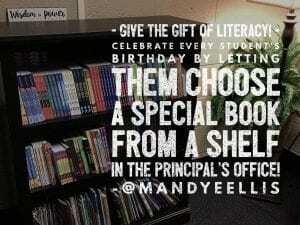 Ever since I became principal in 2012, I have had a birthday bookshelf in my office. Funded by our Parent’s Club and Scholastic Book Fair Dollars, students are announced at our daily morning all school meeting and then come to the office for a book on their birthdays. 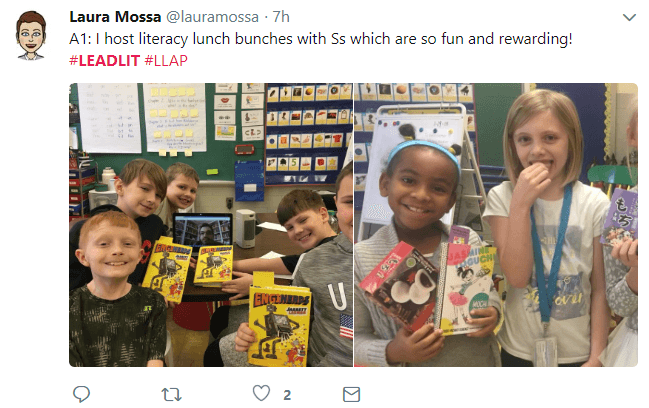 I am able to spend a moment with them, snap a selfie, and gift them with a book. The process is simple and I always like to break it down for others to understand how easy it really is. During morning announcements, share the names of all birthday students. 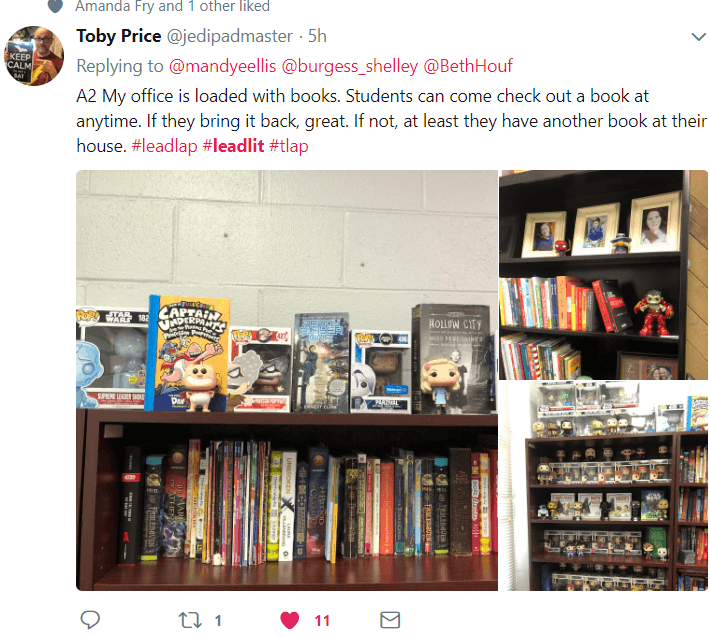 Invite the student to the office following announcement to choose a book from the shelf. 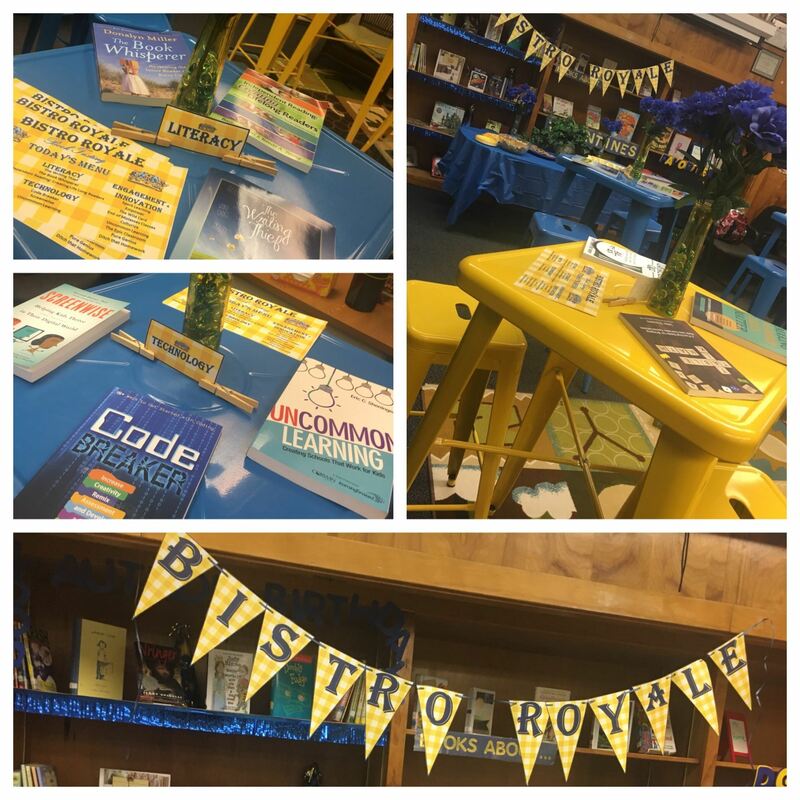 Sign the Book and spend a few moments celebrating the student. This year I intend on adding a few other elements; including a birthday crown (We’re the DGS ROYALS) and personalized bookmark to go with the book. 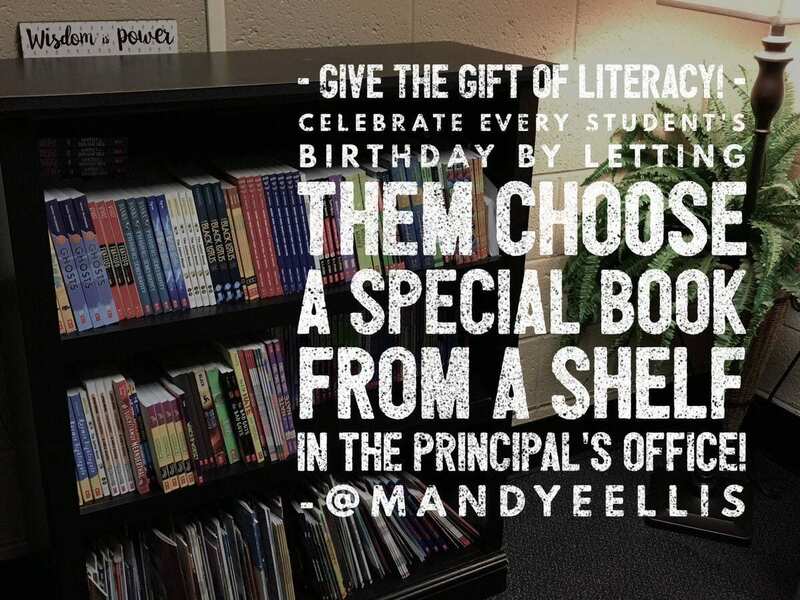 Although I have been doing student birthday books for YEARS, I have reserved gifting my staff books as a whole during back to school time or teacher appreciation week. Many of my efforts have been general in the fact that everyone gets the same book. In many cases, this is powerful and can support important school goals or vision. In other ways, teachers are individuals and have different needs. As the gifting goes this year, I have created the Staff Birthday Book Cart that will be wheeled around to classrooms on staff member birthdays for them to choose a personalized book. I’ve ordered and will stock the book with some favorite professional reads and non-fiction books for teachers to either add to their professional or classroom libraries. 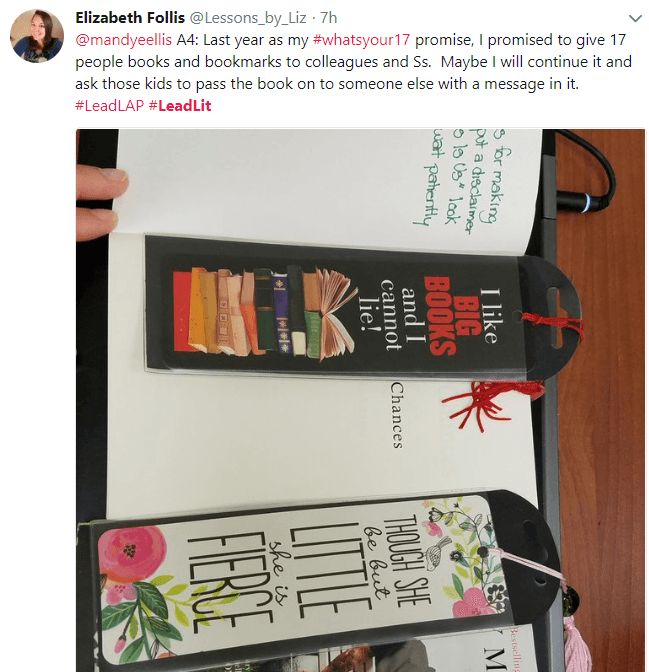 With a personalized card, birthday treat, and book, I’m hoping to recognize staff on their birthdays while promoting a love of reading and literacy. After all, the best gift, is the gift of learning! 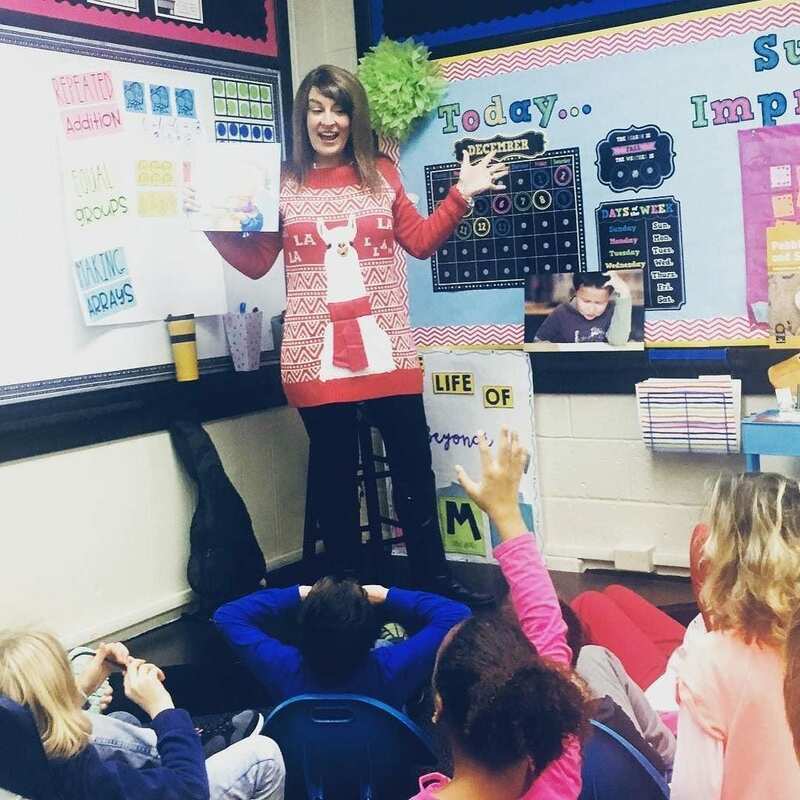 Reading a text and connecting with the message and content can impact teaching and learning. Connecting and learning directly with the author can be transformational. Through the various conferences, workshops, and events I have attended as a teacher and administrator, I have had the chance to have face-to-face meetings with several authors and educational leaders. 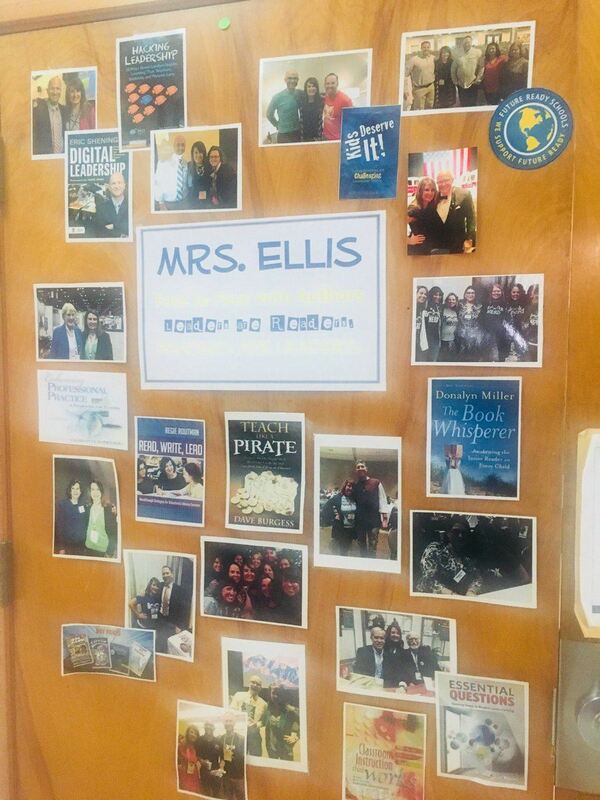 Staff and students see this display grow as I meet some of my favorite authors. Many of the connections I have made with these authors have come on the heels of building relationships on Twitter and developing a PLN that includes industry leaders and trailblazers. This same concept can be replicated even if you haven’t had the chance to meet the authors of the books you are reading. 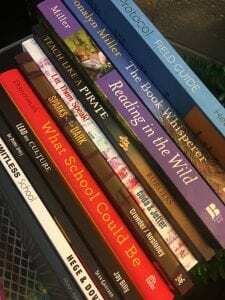 In the school setting, we have ample access to authors. The display could include pictures of the principal or teachers posing for a picture with students who have published their writing in their classroom. 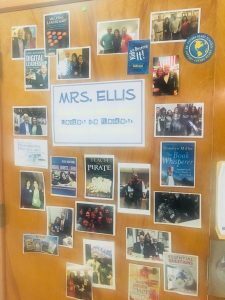 Imagine the thrill a student would experience seeing their picture up on the “Face to Face with Authors” display, knowing that their teacher or principal read their work and provided feedback. Showcasing their accomplishments highlights the importance of literacy and deepens the connection and relationship for the student to the school and classroom. I’ve included some posters below for you to use on your display. Display a simple sign sharing what you’re reading outside your office. In fact, you can have all your staff do this. Reading is important to us, and it should be important to you! 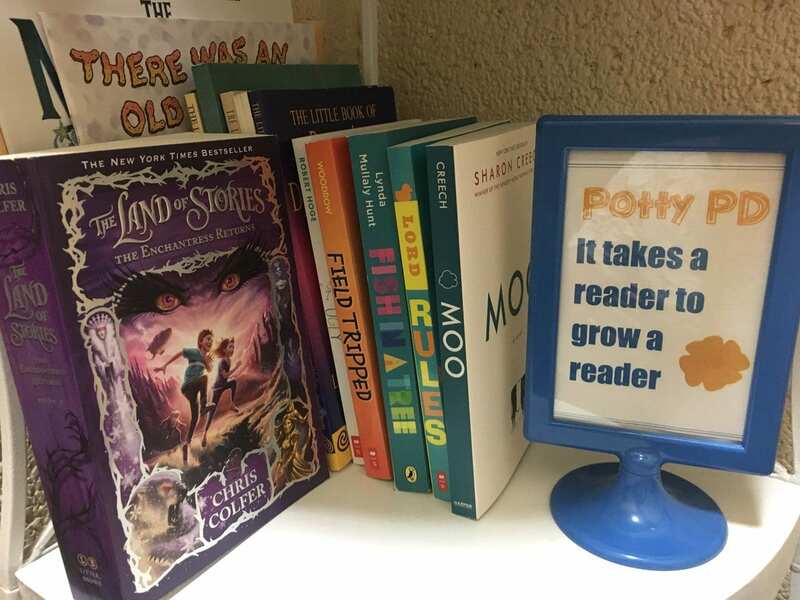 It unifies and subtly reinforces the message that we are all learners and part of a culture of reading. When students know the adults around them are reading, they are given a strong model for lifelong reading. The signs don’t have to be elaborate. Simply print out a letter-size page with the header, “What I am Reading.” Leave space for staff to write in their current book. 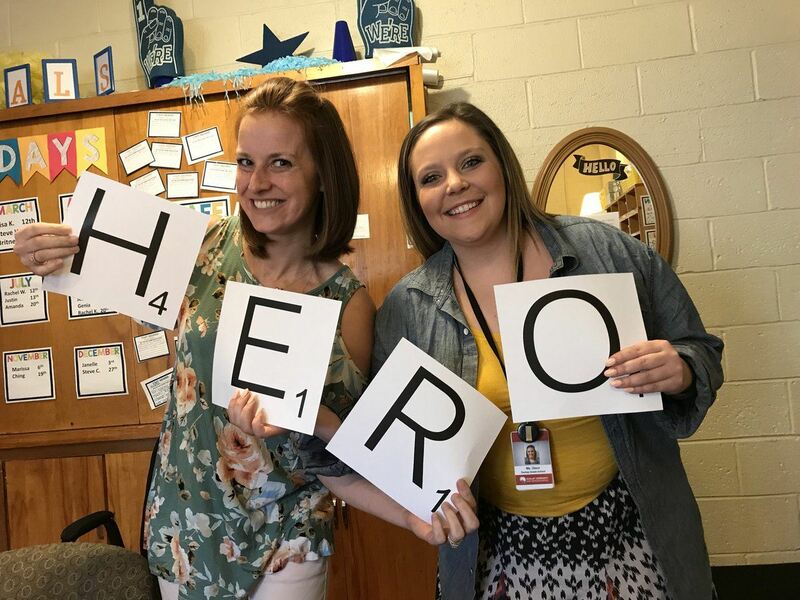 Ask them to display it in an area outside their classroom or office door. 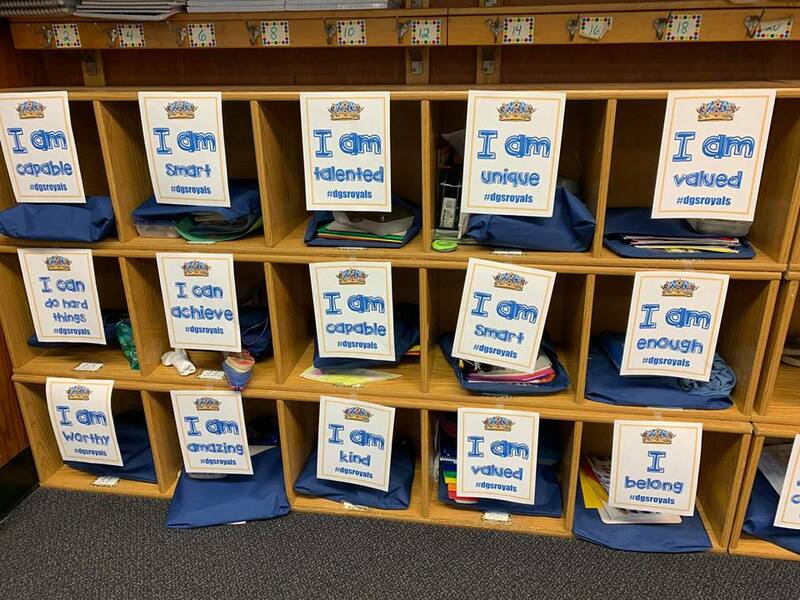 Laminate the signs so they can be updated frequently with dry-erase markers. Alternatively, you could use sticky notes to post new book titles. 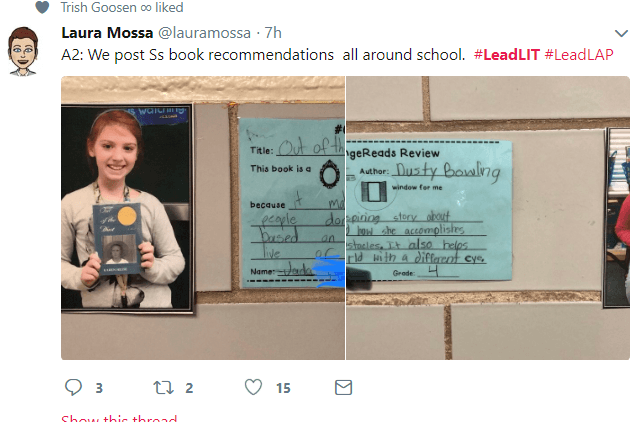 As you do walk-throughs in the building, snap pictures of current book titles on display and share them periodically in school newsletters, staff memos, and social media posts to the school community. comes in sharing the importance of reading. I’ve included some templates for you to use below! Flashcards are a good way to practice math facts, but sometimes, they can be a little dry. And if your child is a kinesthetic learner, he’ll need to move around to learn. 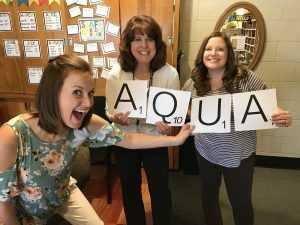 Looking for ways to make learning math facts and sight words more fun and active? 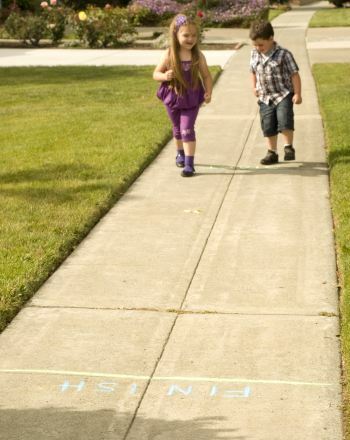 Here’s an activity that challenges your child to use sight word, addition or multiplication facts to run and win a race! Show the children a flashcard from any math deck or set of sight words. The first child to shout out the answer gets to take one step forward. Each child advances when he says the correct answer. I follow the “Staff Appreciation and Motivation” principal group on Facebook. It has been a fantastic resource for ideas and inspiration for building culture and community in my school. 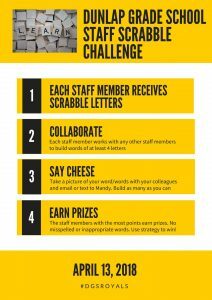 Earlier this spring, I came across the idea of a Staff Scrabble Challenge and wanted to make it happen. Well, who knew that April 13, 2018 is National Scrabble Day. It was perfect timing of coming back from spring break! 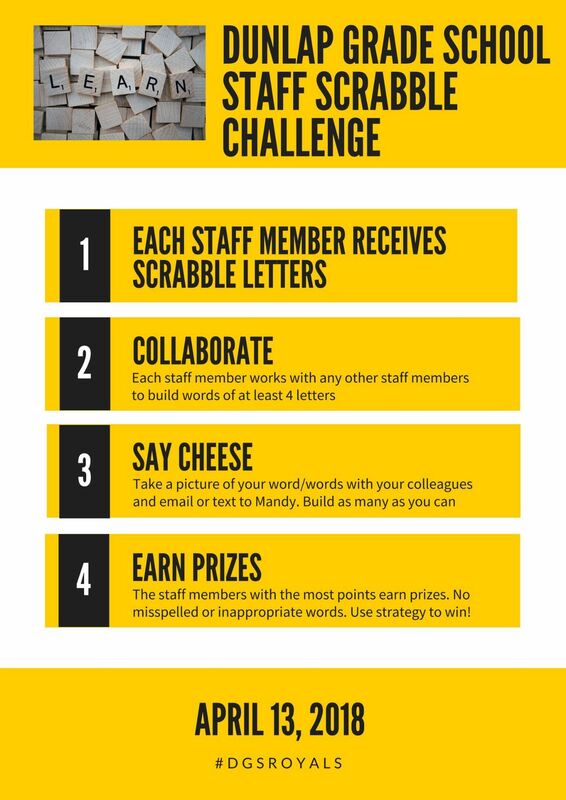 This simple and fun activity is easy to plan and builds community and positive culture with staff. Focusing the words on a particular school goal or initiative. For example, only create words related to math instruction or technology integration. Using FlipGrid, PadLet, or other medium to have staff submit and collect their responses digitally. Asking staff to come up with words related to book characters or book titles.